How many times have you heard someone say I’d love to do the Amazing Race or I’d love to be on Survivor? We have taken team building activities to a new exciting level. Intrepid Racing Team offers a chance to build unity and accelerate your goal setting as you accomplish what you thought was impossible. We are not just another team-building group. We challenge you, by pushing you farther than you’ve gone. We do team building activities for corporations, youth groups, staff members and schools. Kim brings about 15 years of experience with team building. Chris runs Camp Eagle Outdoor Program and together they build an incredible adventure. It may surprise you but we do team building in exchange for sponsorhips. You see we are a team of adventure racers, who race the toughes endurance race on earth Primal Quest. We do team-building because we love bringing people close, and showing them how far they can push themselves. We race because we have a passion for it. By bringing these elements together we are able to race and share that adventure spirit and unity with the world. Below you can read about Team Intrepid and see what we bring to the table. If you like us, let's talk. We can get your team building activities set immediately. Intrepid Racing Team is a little different. We participate in a sport that pushes the envelope of the outdoors. Though we compete on the edge, the team has committed itself to producing a different type of athlete, one that gives back. The mission of the team is “to promote outdoor fitness, to teach others to go beyond what they are capable and promote products that are safe for the environment.” We accomplish this by parenting with companies, local schools and camps. 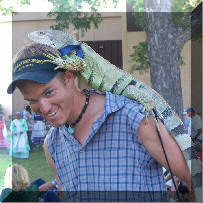 Chris MacWatters is the camp director at CampEagle Outdoor Program. Kim Dunkin works with Covenant Classical School teaching sports and also coaching. Kate Wright is a coach, PE teacher and FCA leader. Todd Phillips promotes outdoor living and inspires his audience with his writing. He also serves our country overseas in the medical field. Intrepid Racing Team was originally founded by Bill Lovelace. The original team had great success with a 3rd place finish at Eco-Challenge. 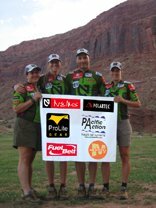 Eco-Challenge put adventure racing on the map and was produced by Mark Burnett. Team Intrepid was made up of world class triathtletes with a dream. In 2005, Kim met and raced with Bill. They formed a friendship. This was Bill’s last race as he was retiring. Kim in the next few years put together a new younger team, but a team with the same values. Though the members are new, Bill serves as mentor and coach. The team has seen a steady success and qualified for nationals this year. 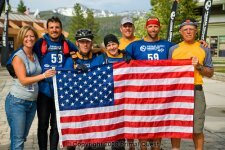 In order to go to Primal Quest the team needs to raise $26,300. In addition to our expenses we will spend close to 25 hours per week in preparation. We will spend most weekends receiving certifications or racing to fully prepare. We are committed to being the best. To date Intrepid Racing Team has raised $2750. We are looking to raise an additional $23,550 by offering our services to family, friends, corporations, schools and teams. In in exchange for sponsorship we have several programs we offer to enrich your company. I offer motivational speaking with live video from Primal Quest. Traveling for 9 days on 2 hours of sleep per night, really gets you in touch with your primal and spiritual needs. I love sharing with others the great parallels from adventure racing to life. The sacrifice that is made for the team when you are severely dehydrated, or think you cannot go on can be applied to our sacrifice for family and teammates. Helping tow a teammate or being towed by a teammate shows us how to succeed while helping others. Persevering through trials is an ever-present theme as well. I love to inspire people to push themselves- To get involved in their niche and serve others in the areas in which they excel. Teaching people to live on the edge both spiritually and mentally is a central theme when I speak. We can do so much more than we think! I would love to share with your group my journey, and inspire them to go on their own successful journey. Intrepid Adventures can range from a few hours of adventure to a week. Journeys may include a 20 mile weekend trek, a survival weekend adventure, or hours on a course that challenges you and the joy is in the finish. One of my most challenging adventures lasted 8 hours. I was doing a trail run and got calf cramps. I struggled for 6 hours, finished dead last, but finished. The joy was in the finishing. Teams are dropped off in a location with basic supplies, a map and a compass. Teams will have 2 days to make the cut off with all of your team in tact, where you will enjoy a home cooked meal and a debriefing with the goal to unify and inspire. Team Intrepid has been in some of the most remote places in the world. Lives have been changed through engaging in tough challenges in the back country. The team leaders have a wealth of knowledge, to inspire, unify and motivate your group. This is not for the faint of heart. The joy is still in finishing, but also in pushing yourself to the limits. If adventure is not your thing, we also offer self-defense. Kim has been putting on self-defense clinics and teaching martial arts for 10 years. She is a second-degree black belt in American Karate. Both men and women will benefit from the self-defense techniques taught. In addition to the above we will promote your company in the following ways upon sponsorship. 1. Promote your products during media and press events. We actively seek out press and opportunities to promote our sponsors. Þ	Extensive coverage on the web Ex. ecoprimalquest.com w/ 1,000,000 hits per day. 2. Take pictures during our races for your use in promotions, testimonials and ads.3. Send reports and pictures of our team using your products. 4. Promote the use of your products by displaying your logo on our uniforms, banners and boxes.5. Promote your product by word of mouth and our true testimonies. Our passion is to race. We also love bringing this passion to others. We cannot do this without support. We are able to race because of partners like you. We would love to help your group, reach for the top and as you help up reach our dreams as well. Who knows one day we might see you at the starting line of Primal Quest. We deeply appreciate you time in considering this proposal. While we train for this great race, we remain focused on our community and enriching it through outdoor programs. I would be honored to visit with you further about Intrepid Racing Team and our journey to Primal Quest and how we could help your company. If you do not have a need for our services and you would like to donate to Intrepid Racing Team you can do so here through our secure checkout. Whether you donate or just encourage us, we thank you for your help. If you would like us to talk with you about our team building programs, or just have a question just contact us below! How many hours of advenuture would you like with Team Intrepid? © Copyright 2008 Extreme-Adventure-Sports.com This website is powered by SiteSell and that is the only site I would choose.